During his career in law enforcement, David Putnam has done it all: worked in narcotics, violent crimes, criminal intelligence, hostage rescue, SWAT, and internal affairs, to name just a few. He is the recipient of many awards and commendations for heroism. 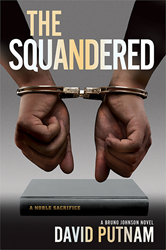 The Squandered is his third Bruno Johnson novel, following the best-selling thrillers and critically acclaimed The Disposables and The Replacements. Putnam lives in Southern California with his wife, Mary. "Putnam’s gripping third Bruno Johnson novel (after 2015’s The Replacements) takes Bruno from Costa Rica, where he fled with the woman who’s now his wife, Marie, and 10 mistreated children he rescued (illegally), back to Los Angeles, to help his incarcerated brother, Noble, whose two young grandchildren have been kidnapped. Unable to turn away from kids in peril, Bruno soon gets mixed up in a caper involving the cocaine trade, a failed heist, and plenty of cold-blooded killers. Luckily, he has help from a nephew also named Bruno (the kidnapped children’s father), some police buddies, and of course Marie. A former police officer, Putnam combines a spot-on procedural with a hero and heroine whose banter and obvious affection for each other provide some welcome levity amid some very dark deeds. At times, awkward excerpts from A Noble Sacrifice, a memoir written by Noble, slow the narrative, but everything else is so well crafted, readers will zip right through this poignant crime thriller." "Violence follows Bruno Johnson around. After a bloody career as a Los Angeles cop, he sought a calmer life as a bartender, but gunmen found him, to their sorrow. In Putnam’s third series entry, Johnson is in Costa Rica, attempting to provide a sane life for children he’s taken―illegally―from abusive homes in the States. But the past catches up. In his cop life, he put his own brother in jail for murder. Now the jailbird sends a message: he needs Johnson back in L.A. What follows is a complex story involving cocaine, diamonds, kidnapping, and―with Johnson on the case―rivers of blood. The revelations, which date back to Johnson’s brother’s arrest, are genuinely startling, and readers will admire Putnam’s ability to unleash a powerful narrative, with interesting characters and high drama, in foursquare, unadorned prose, not a simile or metaphor in sight. When Johnson arms for the final battle, he says he’s going to 'burn down the world.' That’s not really a figure of speech. Action fans won’t be able to turn away."